We present a detailed comparison between modeling and experiments on supercontinuum (SC) generation in a commercial ZBLAN step-index fiber. Special emphasis is put on identifying accurate material parameters by incorporating measurements of the ZBLAN Raman gain, fiber dispersion, and loss. This identification of accurate parameters is of great importance to substantiate numerical simulations of SC generation in soft-glass fibers. Good agreement between measurement and simulation is obtained when pumping both in the normal and anomalous dispersion regimes. R. R. Alfano and S. L. Shapiro, “Emission in the region 4000 to 7000 Å via four-photon coupling in glass,” Phys. Rev. Lett. 24, 584–587 (1970). E. R. Andresen, C. K. Nielsen, J. Thøgersen, and S. R. Keiding, “Fiber laser-based light source for coherent anti-Stokes Raman scattering microspectroscopy,” Opt. Express 15, 4848–4856 (2007). 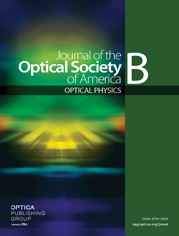 A. Aguirre, N. Nishizawa, J. Fujimoto, W. Seitz, M. Lederer, and D. Kopf, “Continuum generation in a novel photonic crystal fiber for ultrahigh resolution optical coherence tomography at 800 nm and 1300 nm,” Opt. Express 14, 1145–1160 (2006). N. Savage, “Supercontinuum sources,” Nat. Photon. 3, 114–115 (2009). T. M. Monro and H. Ebendorff-Heidepriem, “Progress in microstructured optical fibers,” Ann. Rev. Mater. Res. 36, 467–495 (2006). C. Xia, M. Kumar, O. P. Kulkarni, M. N. Islam, J. Fred, L. Terry, M. J. Freeman, M. Poulain, and G. Maze, “Mid-infrared supercontinuum generation to 4.5 μm in ZBLAN fluoride fibers by nanosecond diode pumping,” Opt. Lett. 31, 2553–2555 (2006). G. Qin, X. Yan, C. Kito, M. Liao, C. Chaudhari, T. Suzuki, and Y. Ohishi, “Ultrabroadband supercontinuum generation from ultraviolet to 6.28 μm in a fluoride fiber,” Appl. Phys. Lett. 95, 161103 (2009). L. Liu, G. Qin, Q. Tian, D. Zhao, and W. Qin, “Numerical investigation of mid-infrared supercontinuum generation up to 5 μm in single mode fluoride fiber,” Opt. Express 19, 10041–10048 (2011). W. Q. Zhang, S. A. V., and T. M. Monro, “A genetic algorithm based approach to fiber design for high coherence and large bandwidth supercontinuum generation,” Opt. Express 17, 19311–19327 (2009). R. T. White and T. M. Monro, “Cascaded Raman shifting of high-peak-power nanosecond pulses in As2S3 and As2Se3 optical fibers,” Opt. Lett. 36, 2351–2353 (2011). D. D. Hudson, S. A. Dekker, E. C. Mägi, A. C. Judge, S. D. Jackson, E. Li, J. S. Sanghera, L. B. Shaw, I. D. Aggarwal, and B. J. Eggleton, “Octave spanning supercontinuum in an As2Se3 taper using ultralow pump pulse energy,” Opt. Lett. 36, 1122–1124 (2011). S. D. Le, D. M. Nguyen, M. Thual, L. Bramerie, M. C. e Silva, K. Lengle, M. Gay, T. Chartier, L. Brilland, D. Méchin, P. Toupin, and J. Troles, “Efficient four-wave mixing in an ultra-highly nonlinear suspended-core chalcogenide As38Se62 fiber,” Opt. Express 19, B653–B660 (2011). M. Liao, X. Yan, G. Qin, C. Chaudhari, T. Suzuki, and Y. Ohishi, “A highly non-linear tellurite microstructure fiber with multi-ring holes for supercontinuum generation,” Opt. Express 17, 15481–15490 (2009). S. Dupont, C. Petersen, J. Thøgersen, C. Agger, O. Bang, and S. R. Keiding, “IR microscopy utilizing intense supercontinuum light source,” Opt. Express 20, 4887–4892 (2012). C. L. Hagen, J. W. Walewski, and S. T. Sanders, “Generation of a continuum extending to the midinfrared by pumping ZBLAN fiber with an ultrafast 1550 nm source,” IEEE Photon. Technol. Lett. 18, 91–93 (2006). C. Xia, Z. Xu, M. Islam, F. Terry, M. Freeman, A. Zakel, and J. Mauricio, “10.5 W time-averaged power mid-ir supercontinuum generation extending beyond 4 μm with direct pulse pattern modulation,” IEEE J. Sel. Top. Quantum Electron. 15, 422–434(2009). D. Anderson, M. Lisak, B. Malomed, and M. Quiroga-Teixeiro, “Tunneling of an optical soliton through a fiber junction,” J. Opt. Soc. Am. B 11, 2380–2384 (1994). C. Agger, S. T. Sørensen, C. L. Thomsen, S. R. Keiding, and O. Bang, “Nonlinear soliton matching between optical fibers,” Opt. Lett. 36, 2596–2598 (2011). C. Petersen, S. Dupont, C. Agger, J. Thøgersen, O. Bang, and S. R. Keiding, “Stimulated Raman scattering in soft glass fluoride fibers,” J. Opt. Soc. Am. B 28, 2310–2313 (2011). X. Yan, C. Kito, S. Miyoshi, M. Liao, T. Suzuki, and Y. Ohishi, “Raman transient response and enhanced soliton self-frequency shift in ZBLAN fiber,” J. Opt. Soc. Am. B 29, 238–243(2011). D. Buccoliero, H. Steffensen, O. Bang, H. Ebendorff-Heidepriem, and T. M. Monro, “Thulium pumped high power supercontinuum in loss-determined optimum lengths of tellurite photonic crystal fiber,” Appl. Phys. Lett. 97, 061106 (2010). J. Lægsgaard, “Mode profile dispersion in the generalised nonlinear Schrödinger equation,” Opt. Express 15, 16110–16123 (2007). J. Hult, “A fourth-order Runge–Kutta in the interaction picture method for simulating supercontinuum generation in optical fibers,” J. Lightwave Technol. 25, 3770–3775 (2007). O. V. Sinkin, R. Holzlöhner, J. Zweck, and C. R. Menyuk, “Optimization of the split-step Fourier method in modeling optical-fiber communications systems,” J. Lightwave Technol. 21, 61–68 (2003). K. Blow and D. Wood, “Theoretical description of transient stimulated Raman scattering in optical fibers,” IEEE J. Quantum Electron. 25, 2665–2673 (1989). M. Horita, FiberLabs, KDDI Laboratories Building, 2-1-15 Ohara, Fujimino-shi, Saitama 356-8502, Japan (private communication, 2011). S. T. Sørensen, A. Judge, C. L. Thomsen, and O. Bang, “Optimum fiber tapers for increasing the power in the blue edge of a supercontinuum—group-acceleration matching,” Opt. Lett. 36, 816–818 (2011). M. Frosz, P. Falk, and O. Bang, “The role of the second zero-dispersion wavelength in generation of supercontinua and bright-bright soliton-pairs across the zero-dispersion wavelength,” Opt. Express 13, 6181–6192 (2005). F. Gan, “Optical properties of fluoride glasses: a review,” J. Non-Cryst. Solids 184, 9–20 (1995). J. Y. Lee and D. Y. Kim, “Versatile chromatic dispersion measurement of a single mode fiber using spectral white light interferometry,” Opt. Express 14, 11608–11615 (2006). S. R. Loehr and C. T. Moynihan, “Effect of H2O partial pressure on the rate of hydration of ZrF4─BaF2─LaF3─AlF3 glass,” Mater. Sci. Forum 32–33, 261–265 (1991). D. Szebesta, S. Davey, J. Williams, and M. Moore, “OH absorption in the low loss window of ZBLAN(P) glass fibre,” J. Non-Cryst. Solids 161, 18–22 (1993). G. Agrawal, Nonlinear Fiber Optics, 4th ed. (Academic, 2006). R. H. Stolen, J. P. Gordon, W. J. Tomlinson, and H. A. Haus, “Raman response function of silica-core fibers,” J. Opt. Soc. Am. B 6, 1159–1166 (1989). R. M. Almeida and J. D. Mackenzie, “Vibrational spectra and structure of fluorozirconate glasses,” J. Chem. Phys. 74, 5954–5961 (1981). Y. Durteste, M. Monerie, and P. Lamouler, “Raman amplification in fluoride glass fibres,” Electron. Lett. 21, 723–724 (1985). T. Mizunami, H. Iwashita, and K. Takagi, “Gain saturation characteristics of Raman amplification in silica and fluoride glass optical fibers,” Opt. Commun. 97, 74–78 (1993). A. Saïssy, J. Botineau, L. Macon, and G. Maze, “Diffusion Raman dans une fibre optique en verre fluoré,” J. Phys. Lett. 46, 289–294 (1985). T. Nakai, N. Norimatsu, Y. Noda, O. Shinbori, and Y. Mimura, “Changes in refractive index of fluoride glass fibers during fiber fabrication processes,” Appl. Phys. Lett. 56, 203–205 (1990). A. V. Husakou and J. Herrmann, “Supercontinuum generation, four-wave mixing, and fission of higher-order solitons in photonic-crystal fibers,” J. Opt. Soc. Am. B 19, 2171–2182(2002). C. Lin, V. Nguyen, and W. French, “Wideband near-i.r. continuum (0.7−2.1 μm) generated in low-loss optical fibres,” Electron. Lett. 14, 822–823 (1978). P. Beaud, W. Hodel, B. Zysset, and H. Weber, “Ultrashort pulse propagation, pulse breakup, and fundamental soliton formation in a single-mode optical fiber,” IEEE J. Quantum Electron. 23, 1938–1946 (1987). J. M. Stone and J. C. Knight, “Visibly ‘white’ light generation in uniform photonic crystal fiber using a microchip laser,” Opt. Express 16, 2670–2675 (2008). Fig. 1. Experimental setup for our SC measurement. Fig. 2. Dispersion parameters: solid black curve, calculated dispersion parameter; red curve, measured dispersion profile; dashed black, dispersion calculated from wavelength-shifted effective index (inset, dispersion in the full calculation domain). Fig. 3. (a) Black, lower, solid curve is measured absorption in a multimode fiber (courtesy FiberLabs ), and the blue, upper curve is the artificially added loss due to OH. (b) GV curves from both β(ω) and β′(ω). Fig. 4. Raman gain profile measured at λpR=2πc/ωpR=1650 nm. Dots are experimental data, and the solid curve shows the fit given by Eq. (11) and Table 1 . Fig. 5. Photon number error as a function of the propagation distance for a typical simulation neglecting loss and noise. P0=1110 kW, TFWHM=110 fs and λp=2000 nm. Fig. 6. Spectrograms of the λp=1450 nm and P0=1180 kW simulation at (a) z=1.0 cm, (b) z=5.3 cm, and (c) z=L. The white dashed line marks the calculated ZDW of the fiber. Fig. 7. Measurement (black) and simulations (dashed green) of SCG for λp=1450 nm and P0=710 kW. The dotted red spectrum is obtained for the wavelength-shifted dispersion profile in Fig. . Dashed vertical lines mark pump wavelength (black) and the ZDW (red, green) of the fiber. Fig. 8. (a) Measurement (black) and simulations (dashed green) of SCG for λp=1450 nm and P0=1180 kW. The dotted blue curve shows the simulation with artificial loss shown in Fig. 3. (b) The dotted red spectrum is obtained for the wavelength-shifted dispersion profile shown in Fig. 2. Dashed vertical lines mark the pump wavelength (black) and the ZDW (red, green) of the fiber. Fig. 9. Spectrograms of the λp=2000 nm and P0=1110 kW simulation at (a) z=1.0 cm, (b) z=5.3 cm, and (c) z=L. White dashed lines mark the calculated ZDW of the fiber. Fig. 10. (a) Measurement (black) and simulations (dashed green and dotted blue) of the SCG for λp=2000 nm and P0=1110 kW. The dotted blue curve shows a simulation with the artificial loss shown in Fig. 3. (b) The dotted red spectrum is obtained for the wavelength-shifted dispersion profile shown in Fig. 2. Dashed vertical lines mark the pump wavelength (black) and the ZDW (red, green) of the fiber. Fig. 11. Measurement (black) and simulations (dashed green) of the SCG for λp=2000 nm and P0=2130 kW. The dotted red spectrum is obtained for the wavelength-shifted dispersion profile in Fig. 2. Dashed vertical lines mark the pump wavelength (black) and the ZDW (red, green) of the fiber. Fig. 12. Measurements (black) and simulations (dashed green) of SCG. Top, normal pumping with λp=1450 nm, TFWHM=145 fs, and (a) P0=710 kW and (b) P0=1180 kW. Bottom, anomalous pumping with λp=2000 nm, TFWHM=110 fs, and (c) P0=1110 kW and (d) P0=2130 kW. Dashed magenta curves shows SCG for P0 reduced by 20%.